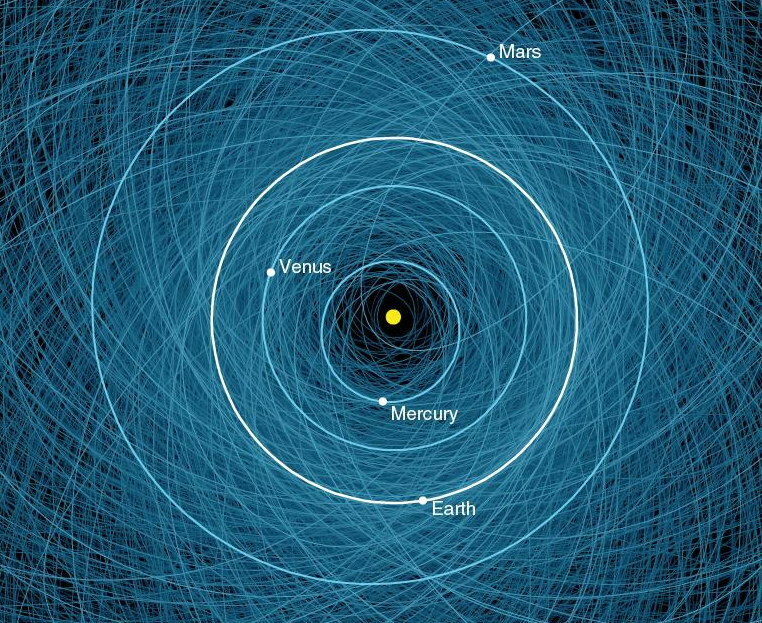 Scientists figure that a million asteroids are big enough and close enough to our world to be a serious threat from a head-on collision, even though only about 1,400 of them have been detected and charted, as depicted in this NASA diagram. 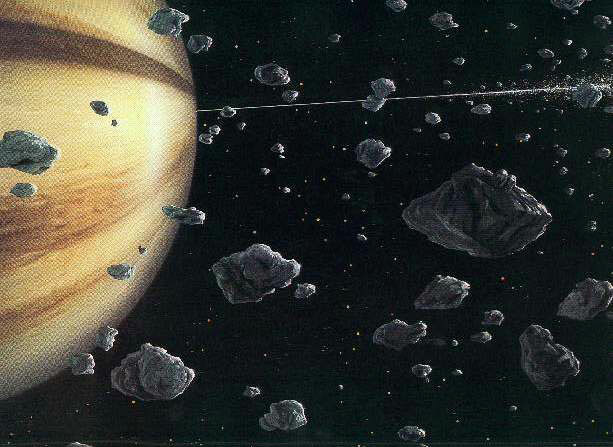 If you’ve been following this blog or its macyafterlife counterpart, you know I’m convinced that the asteroids are all shrapnel from an explosion, some 4 billion years ago, of a planet called Marduk that used to orbit the sun just beyond Mars. Marduk, or Eden, was inhabited by a race of superhumans who were busy colonizing nearby planets when their home planet was destroyed by their massive technologies, and the colonists who became marooned on Earth were the last living Edenites. Even though that ancient scenario boggles modern minds, I’m fairly certain it’s true, thanks to my research over the past quarter-century, especially a series of ITC contacts that our INIT group received from a cluster of seven ethereal beings shedding important light on our ancient heritage. There’s also some good, hard evidence to support the notion that people lived on Earth many millions of years ago and were deeply concerned by asteroids… evidence such as this 65-million-year-old “Ica stone” depicting an ancient astronomer. This is one of many such stones dug up near Ica, Peru. “Ica stone” depicting ancient astronomer searching for asteroid remnants of Marduk. 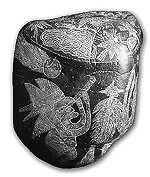 Many other Ica stones show humans interacting with dinosaurs. The validity of the Ica stones as relics of ancient times when humans and dinosaurs coexisted is rigorously denied by modern science. The skeptical systems of modern civilization that have sprouted from scientific blinders went so far as to brow-beat a local farmer and his wife into claiming they’d faked the stones!… (tsk, tsk). So, while I’m convinced of the basic scenario of our ancient heritage on Marduk, or Eden, there are still a lot of difficult questions among the details. Pieces of the puzzle are slowly coming together in my mind, as the tangle of fact and fiction in ancient legends painstakingly unravel under the light of ITC communications from finer spiritual realms. Marduk is also the name of the greatest god of the ancient Babylonians, whom I’ll discuss in a moment. I seriously doubt whether this is all mere coincidence. These things almost have to be inter-related. Here’s what I think happened. The fall of Atlantis brought to a close the First Epoch of “the Project”… that is, the development of a noble-savage human species suited to a noble-savage planet Earth… where life kills life to survive. Babylon was the first great civilization in the Second Epoch. Marduk (probably pronounced maruTOOK) was the name of the principle Babylonian god around 1500 BC… some 3,500 years ago… the first major god leading us humans into the Second Epoch. Although we modern humans shrug off the ancient gods as myth (thanks again to scientific dogma), I know from ITC contacts that the superhuman Edenite castaways on Earth and their gifted progeny (sometimes called Titans) were the subjects of most of the stories about ancient gods. Down through the ages those stories became a tangle of fact and fiction. Marduk was depicted on one hand as a brutal god in a brutal world, vanquishing other gods in war and ravaging the land with tornadoes, floods, and other natural disasters. On the other hand, Marduk was praised as bel rabim (great lord), bêl bêlim (lord of lords), ab-kal ilâni bêl terêti (leader of the gods), aklu bêl terieti (wise lord of oracles), and muballit mîte (reviver of the dead). I strongly suspect that Marduk was either one of those ancient Edenites, or one of their gifted progeny, or else an ethereal being working closely with the Earth… just as The Seven ethereals worked closely with our INIT group to facilitate a series of world-changing ITC communications in the latter years of the 20th Century. Who knows, the god Marduk might even have been the same being as the one we know as Technician… or another, very powerful being of Technician’s ilk. These great souls do not have names as we humans do; we give them names when they interact with our world. and the constant threat of global upheaval in the event some of the asteroid shrapnel collides with the Earth. This entry was posted in After we die, Heaven and Earth, ITC, Other-worldly matters, Our ancient heritage, Our paradise destiny, Science and Technology, Spiritual realms, what then? and tagged asteroid impact, astronauts at the UN, Babylonian gods, marduk. Bookmark the permalink.